With the regular season in the books and the NFL regular season winding down, fans everywhere are turning their attention to the 2018 NFL Draft. Teams looking to up their production in the air will be in for a treat, as the current quarterback class is considered one of the deepest in history. But there is plenty of talent elsewhere, from edge rushers to running backs. Below, take a look at 30 of the biggest names heading into the 2018 draft. What scouts like: With Allen, it's all about the physicality. The Californian has a combination of size, arm strength and mobility that's rarely seen in the NFL, even among the game's elite signal callers. He parlayed those gifts into a 144.9 passer rating last season. In 2017: Allen threw for 1,658 and 13 touchdowns in 10 games. It wasn't the best campaign, but he was going to need time to develop no matter what. What scouts like: No one's going to mistake Kansas for a football powerhouse, but they do have one of the nation's best edge rushers in Armstrong. His quickness is his main calling card, but he's also capable of delivering powerful hits once he reaches the ball. He should be one of the best athletes available. In 2017: His sack totals were way down, but he still set a career high in tackles with 63. What scouts like: A prototypical modern running back, Barkley has the speed, explosiveness and vision to become a star. He's been favorably compared to Ezekiel Elliott, who finished third in the NFL MVP voting as a rookie last fall. In 2017: Barkley had a terrific start to the season, and while he faded down the stretch, his totals are still outstanding: 1,134 rushing yards, 594 receiving yards, and 19 total touchdowns. What scouts like: At 6-foot-8 and 345 pounds, Brown is one stubborn specimen on the offensive line, but unlike many players of his size, his footwork is highly regarded. Add that to his hard-nosed style of play, and he looks like a high pick. In 2017: He protected Baker Mayfield, who had a Heisman-quality season for the Sooners. They'll play Georgia in the Rose Bowl, with the winner advancing to the national championship game. What scouts like: Out of a defensive line overflowing with talent, Bryant has demonstrated the most big-play potential. His superior size and length make him a nightmare for opponents, and while he could stand to improve his technique, he has a chance to become a real star in the NFL. In 2017: Bryant was one of the foremost defensive ends in the ACC, recording 47 tackles — 14.5 of them for a loss. What scouts like: While he's not the most prominent player on the national level, Chubb spent the 2016 season terrorizing ACC quarterbacks. He's known for his quickness off the snap, as well as the lethal rip move he uses to shed tenacious blockers. In 2017: Chubb recorded 72 tackles and 10 sacks, leading the Wolfpack in the latter category. He could be the first edge rusher selected. What scouts like: USC has developed its share of quarterback prospects over the years, and Darnold could be the best one in a while. He's got a cannon for an arm and a keen eye for making plays, and NFL coaches will love his cool under pressure. In 2017: Darnold led the Trojans to a record of 11-2, posting totals of 26 touchdown passes and 3,787 passing yards with a 151.0 passer rating. What scouts like: The latest in a long line of talented defensive backs to emerge from Nick Saban's Alabama squads, Fitzpatrick is at his best as a roaming safety. His versatility and instincts make him a valuable piece who can follow routes, grab picks and defend against the run. In 2017: Fitzpatrick recorded 52 tackles, 1.5 sacks, and an interception. Those aren't the most impressive totals, but he's still locked in as one of the best prospects in the class. What scouts like: Hurst has an explosive first step and terrific instincts, which help him make up for his lack of size. Scouts have compared him to Aaron Donald of the Los Angeles Rams, who has recorded 36 sacks through his first four NFL seasons. In 2017: He recorded 13 tackles for loss, good for sixth in the Big 10. He also recorded 5.5 sacks. What scouts like: Jackson, the reigning Heisman Trophy winner, is a prototypical dual-threat quarterback with a strong arm and an uncanny ability to slip past defenders. Playing in Bobby Petrino's system has helped him develop a solid understanding of how to run an offense. In 2017: He had another terrific campaign, with 3,489 passing yards and 42 total touchdowns. He was a Heisman Trophy finalist. What scouts like: James' athleticism is off the charts. He has the strength and speed to be a longtime contributor, and with the ability to play both defensive back and linebacker, he can be a major asset for any defense. In 2017: He recorded 84 tackles and two interceptions, including a thrilling pick-six against Delaware State on November 18. After a campaign like that, his top 10 potential is power clear than ever. What scouts like: Thanks to his size, speed and instincts, Key should be the best pass rusher available if he declares. One former NFL defensive end believes Key has a greater upside than Myles Garrett, the top pick in the 2017 Draft. In 2017: He recorded just 33 tackles and 4 sacks, but both of those numbers were deflated due to late-season surgery on his pinky finger. He is expected to return in time for the Citrus Bowl. What scouts like: Kirk has the speed to find the end zone on any given reception, so he could be a big weapon for an NFL offense. He's great at evading defenders and has proven himself to be a reliable route runner. In 2017: He recorded a team-high 730 yards and 7 touchdowns. What scouts like: Another player with great pass rushing instincts, Landry is renowned for his speed. He has an arsenal of slick moves, is lighting quick off the edge and can competently defend against the run. In 2017: Landry recorded five sacks in eight games after being halted by an ankle injury near the end of the season. He may be bound for the first round anyway. What scouts like: Love's main calling card is his versatility — he looks equally comfortable navigating through traffic and creating separation with an open field. He's also athletic enough to succeed as a pass catcher, though the Cardinals have not made a habit of using him in this capacity. In 2017: Love emerged as a breakout star, rushing for 1,973 yards and 17 touchdowns. He was named a Heisman Trophy finalist. What scouts like: The case against Mayfield essentially boils down to two potential red flags: his height and his conduct. There are no such concerns about his arm strength, and evaluators have lauded his knowledge of the game. He's drawn comparisons to Russell Wilson, though those have mostly come from the most starry-eyed of scouts. 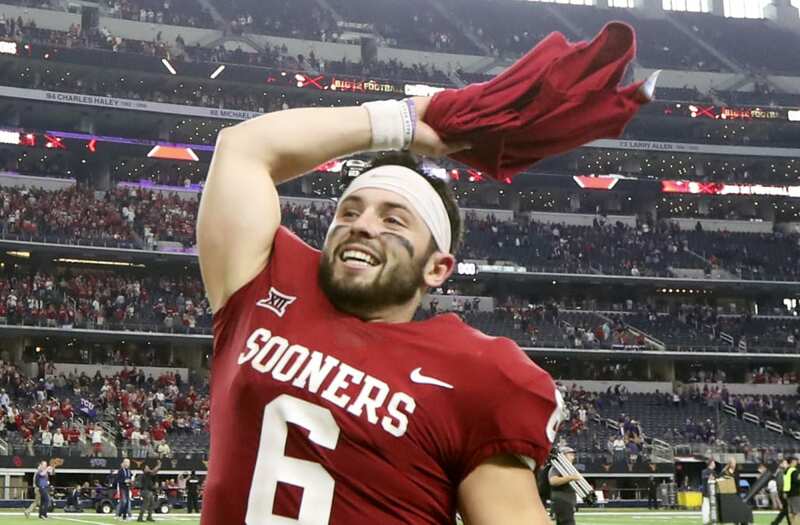 In 2017: Mayfield passed for 4,340 yards and 41 touchdowns, good for a passer rating of 203.8. What scouts like: With the size and strength to go up against any receiver, McFadden excels in press coverage. The modern NFL's emphasis on passing makes a first-rate cornerback a necessity for every team, and he has the potential to morph into just that. In 2017: McFadden didn't record an interception, a surprising result given his 2016 season, when he had eight. He still has the physical tools to be a top choice, but teams might be more cautious now than they were heading into the year. What scouts like: McGlinchey has the skill to be an NFL contributor for years to come. He's great at keeping his balance, going after the opposition's top pass rushing threat and abandoning a double team when the time is right. In 2017: Part of an outstanding offensive line at Notre Dame, McGlinchey blocked for Brandon Wimbush and the run attack. The Fighting Irish went 9-3 and will face LSU in the Citrus Bowl. What scouts like: Nelson is one of the most powerful interior lineman in the nation, regularly making full use of his size and strength to bully defenders into submission. He can be an immediate contributor in the NFL. In 2017: He protected Brandon Wimbush, and the Fighting Irish went 9-3. Nelson was nominated for the Outland Trophy, awarded annually to the best interior lineman in college football. What scouts like: Payne is a physically dominant defensive lineman who can stop the run and enable key sacks with his reliable blocking. He dominated against guards last fall, and he appears to have plenty of room to grow. In 2017: It wasn't a great season for the Alabama defense, but Payne continued to prove his worth, recording 45 tackles against some brutally tough matchups. The Crimson Tide went 11-1 and will play Clemson in the Sugar Bowl. What scouts like: Ridley is an elite route runner who can use his explosiveness to create separation from even the best cornerbacks in the country. He's a versatile receiver who can line up anywhere, and he'll face some sterling defensive competition this year. In 2017: Ridley went for 896 yards and just 3 touchdowns, disappointing numbers at first glance. However, he did so on just 55 catches, good for a rate of 16.3 yards per reception. What scouts like: With a smooth throwing motion and a rocket arm, Rosen has the physical tools to become a prolific passer in the NFL. His quick footwork helps him avoid big losses when under duress. In 2017: Rosen threw for 3,717 yards and 26 touchdowns. Even though he led the Bruins to just six wins, it was exactly the kind of season he needed following his truncated 2016 campaign. What scouts like: With size and arm strength to spare, Rudolph certainly looks the part of an NFL starting quarterback. Given head coach Mike Gundy's quirky system, many scouts are not completely sold on him, but the 2018 quarterback class could come off the board quickly. In 2017: He threw for 4,553 yards and 35 touchdowns, both career highs. He also threw a personal-worst of nine interceptions, though the Oklahoma State offense remained as prolific as ever. What scouts like: Smith may be a tad undersized for an NFL linebacker, but he has an awful lot of strength packed into his 6-foot-1, 225 pound frame. He has also become a leader of the Bulldogs defensive unit, complete with versatility and an outstanding feel for the game. In 2017: He made 113 tackles, the most of any Georgia player by a wide margin. He also led the team with 5.5 sacks. What scouts like: Sutton lacks elite speed, but he makes up for that with his tendency to make contested catches. He's a tall, muscular receiver with a fiery competitive streak and a track record of success. In 2017: He recorded 1,017 receiving yards and a career-high 12 touchdowns. SMU went 7-5, its best record since the 2011 season. What scouts like: At 6-5 and 340 pounds, Vea undoubtedly possesses the size to compete in the NFL, but that's not the only thing he has going for him. He's also notably quick after the snap, making him a tough matchup for any interior lineman. In 2017: He recorded 37 tackles and 3.5 sacks — both down from last year, but in three fewer games. Washington continued to field one of the best defensive units in the nation. What scouts like: Ward's length and hands make him one of the most tantalizing defensive backs available. Even if he lacks the strength to bully opposing receivers, he can still affect the game simply by finding his way to the ball. He's also plenty fast. In 2017: He saw his role in the Ohio State defense expand greatly. He recorded 37 tackles and grabbed 2 interceptions, the first of his collegiate career. What scouts like: With his knack for making big plays, Washington could be a first-rate receiver in the NFL. His speed will make him hard to overlook, and his ability to track the ball is second to none. In 2017: Washington continued to play a major role in the Cowboys offense, going for 1,423 yards and 12 touchdowns. He won the Fred Biletnikoff Award as the best wideout in the nation. What scouts like: On the field, Webster has just about everything you could want in a cornerback: speed, strength, and instincts. The only knocks against him are a serious ACL tear in 2016 and a shoplifting arrest from earlier this year. In 2017: It's been a year to forget for Ole Miss, but Webster had a very good campaign, especially after missing the entirety of the 2016 season. He recorded 29 tackles and broke up potential gains with consistency. What scouts like: Wilkins is a great interior pass rusher with a combination of size, strength and explosiveness that makes him a rare specimen. He can make his teammates better by taking on difficult double teams. In 2017: He recorded 52 total tackles and 5 sacks, both career highs. Now check out the next great Japanese sensation coming to MLB.